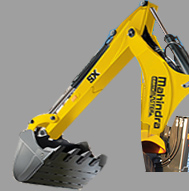 Our designers at Mahindra looked at the current scenario and made some dramatic leaps in the technology of our own Backhoe Loader and designed EarthMaster SX specifically for Indian usage patterns that breaks all the standards in the Backhoe Loader category. Mahindra has taken its learnings from tractor engines, to bring its fuel efficiency down to an incredible 4.5* litres per hour. With better technology and design enhancements, Mahindra has been able to lower lubricant, refilling requirement with extended service intervals, thus reducing the overall maintenance cost. 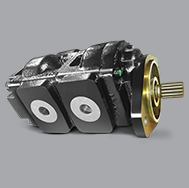 Hydraulic Oil: 50 litres with 2000 hours change interval, Rear Axle Oil: 17.1 litres with 1500 hours change interval, Engine Oil: 13 litres with 500 hours change interval, Transmission Oil: 10.2 litres with 1000 hours change interval. Simple ideas, lead to great improvements. Mahindra EarthMaster SX is a substantially faster machine loaded with features that lead to far greater productivity. 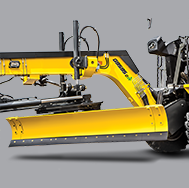 Banana Boom with 7% more reach, Rugged and reputed Gear Pump, Maximum Dig Depth: 4959** mm, Loader Dump Height: 2708 mm. Mahindra believes that the most important part of the machine, is the person operating it. That’s why we have worked hard to make his experience the most comfortable for his long hours of work. 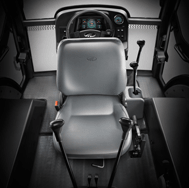 Ergonomic layout and seating – all controls are smooth and easy to reach, Advanced Mechanical Control Levers, 21st century styling, with plush car like interiors, Personal Storage Space and Tool Box with easy access. 100Ah, 12V, Low maintenance battery. With Speedometer, Turn and Head Light Signals indicating RPM, Kilometers Run, Hours Run, Fuel Level, Temperature. Technical specifications, features are subjected to change without prior notice. Image used are for representative purposes only. Accessories shown may not be a part of the standard prouct. Actual colours may vary. E & O.E. ^ Standard Exclusions Apply. For further details on the warranty, please contact your dealer. # Value measured under specific measuring condition.